STRATHCLARE HOUSE is conveniently situated in the centre of this picturesque old highland village, at the gateway to the Cairngorm National Park. Surrounded by magnificent scenery, KIRKMICHAEL is at the geographical centre of Scotland making it the ideal touring base with much of the country, within a day's trip. 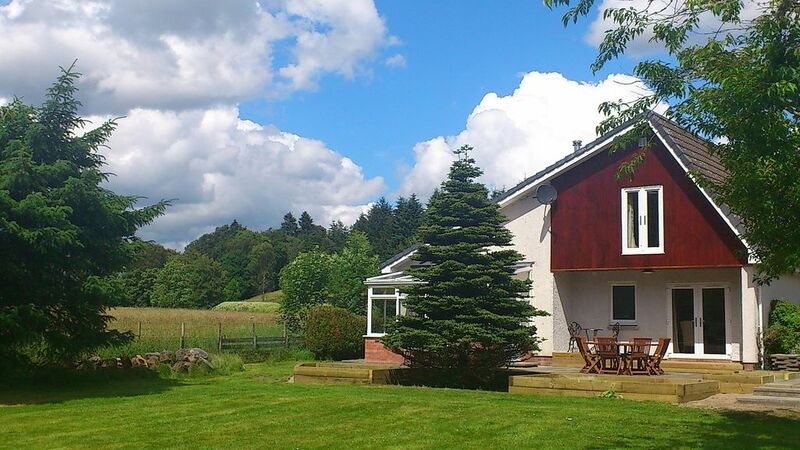 A beautiful house in an idyllic countryside setting in the village of Kirkmichael, with welcoming luxury furnishings and a cosy ambiance, this luxury holiday home offers relaxation in abundance. A perfect place to sleep up to 8 people for a family self-catering getaway or as a break with friends, you'll leave refreshed and rejuvenated after a stay at Strathclare House. A very special setting for a very special holiday home, with lots to do in the local area come rain or shine. Key features are the open plan living to cater for 8 people with 4 bedrooms, ensuites for the 3 double bedrooms plus a shared bathroom for the twin bedroom. The lounge has 50'' TV with satellite TV and surround sound system / Blu Ray player whilst each bedroom has is equipped with TV and freesat. Wi-fi is available for the house. Outside, the house opens up to a large secluded garden with the River Ardle at the bottom of the garden. We are also dog friendly and accept up to 2 well behaved dogs. Please note that the property is Non Smoking. Hi there. My name is Kenny and I live and work in Scotland with my wife, Kim. Kim and I have a holiday home in Kirkmichael, Perthshire, Scotland which has recently been renovated and is new on the market as a luxury holiday home. We have spent many holidays in Perthshire for many years and fell in love with the area. This made us purchase our property and the intention is that we will eventually retire to this house in several years time. We are sure that you will the area as much as we love the area. My wife Kim and I have spent many holidays in Perthshire and decided we wanted to buy a house with the aim of allowing others to enjoy the area before we eventually retire to Kirkmichael. This luxury detached holiday home is located down a quiet lane off of the main street. The spacious, delightful, secluded garden sits in an acre of grassland and is ideal for alfresco dining, and the house is within easy walking distance of the village pub, restaurant and well-stocked community shop. The house sleeps 8 people and has 3 double bedrooms with ensuites plus a twin bedroom with shared bathroom. It is perfect for a group of friends or families to enjoy the open plan lounge / dining and kitchen (12*5 metres). Strathclare House is the perfect destination for exploring, or taking part in outdoor activities such as fishing, walking, cycling, skiing and hiking. A little further north takes you to Glenshee ski slopes or you can simply relax in the peace of village life. Oil Central heating provided. Works off HIVE and has thermostat controls on each radiator. Bed linen provided for each bedrooom. Wifi is part of the package. Bath and hand towels provided together with face clothes and robes. Open plan room with Patio Doors and view to the river. Panasonic 50 inch Flatscreen TV, Sony surround sound system with Blu ray player & Sky freeview satellite TV. Wi-fi is provided. Dining for 8 people. American style fridge freezer with ice make and cold water supply. Satelite TV provided in house. IPod docking station provided and works with DVD / CD player. DVD player plus NETFLIX provided. selection of DVDs but there is access to films via NETFLIX. Large secluded garden with a large lawn which goes down to the river - 50 metres away. The master bedroom upstairs has a Juliet Balcony with wonderful views down the garden to the river. Patio area with table and chairs for 8 people with a view down the garden to the river. The groundfloor bedroom patio doors opens out onto a small decking area and then onto the patio. Glenshee ski resort is a 30 minute drive from the house. Blairgowrie golf course - Rosemount 12 mile Blairgowrie golf course - Lansdowne 12 miles Pitlochry golf course- 12 miles all these courses are within a half hour drive St Andrew's bay and golf course is approximately 1 and a half hours drive from the house. Outside: Large secluded private garden in acre of land. River at bottom of garden which is fenced off. Large patio area with dining table and chairs plus a barbecue. Patio doors from bedroom open up onto decking and then onto the main patio area. French sliding doors in lounge open into conservatory with an external door to patio area. Utility room has a porch with access to side of garden. Utility Room: Sink, washing machine, ironing board and steam generated iron, clothes horse. Cleaning / Towels / Linen / Maid service: We do an on site meet and greet. Bed linen, towels and robes are supplied. The property is cleaned once a week. Other: Each bedroom has a TV with freesat. The twin room also has a DVD player. Hair dryers are provided. Excellent well equipped house. The hosts Kenny & Kim were so helpful & kind. The house is perfect with every gadget you could imagine making it ideal for cooking meals while the log fire burns & family games are played at the dining room table. We had an excellent family holiday & will definitely be back. Kenny & Kim left us a lovely hamper with something for everyone even dentastix for the dog. The house is spotless & all bedrooms being ensuite meant everybody had their own private space. Definitely a 5 star property. Fantastic house and gardens . Everything you could want for 8 people. Fantastic house and gardens . All you could want for 8 people or extended family. Garden lovely and big but open up to the river if anyone has young children they would need to be careful . Delighted you and your family enjoyed the house and garden. Many thanks for your comments. Second stay at strathclare house. Beautiful, spotless house with everything you could ever need. Extended family trip with plenty space for everyone! Huge garden to enjoy and in a great location. Lovely hamper left for us and chocolate bunnies left on our pillows. Lovely touch! Owners are great to deal with, very friendly. Don't think we will ever find a better house to stay in for a holiday! Delighted you all had a lovely time and hopefully we will see you again in the future. Enjoyed our stay in a warm, well equipped house. Good facilities in a good location. Delighted that you enjoyed your stay at our holiday home. Appreciate the comments. We stayed here at the beginning of December to celebrate my special birthday. My daughter did the organising, which was straightforward and any queries or information she asked for, were answered promptly. The house was perfect for our family group of 6 adults and our dogs. We were delighted with the space throughout the house - the living/dining area is great for sitting together and everyone feeling involved. Superb kitted out kitchen, with all equipment provided, including dish/hand towels, provisions for dishwasher and cleaning, selection of condiments, fab size fridge/freezer, plenty dishes and selection of crockery. There was a super hamper left for us, crackers, coffee, shortbread, goodies for the dogs and the lovely gift of a bottle of champagne ! Good sized utility room to keep the dogs dishes, food and towels. All bedrooms are spacious, neutral colour palette, lovely quality linen, duvets and very comfortable mattresses. Decent towels provided, including a bath sheet rather than the normal smaller size! The en-suites are lovely and spacious, upstairs 2 with underfloor heating - great start to the morning! Plenty storage in the rooms and linen baskets for the washing. We loved the outside space, and appreciated being able to give the dogs a walk without having to leave the garden perimeter. We arrived a few days after a snowfall so it looked very pretty, it’s well laid out for any season, with patio table and chairs. The river at the bottom was very fast flowing, so I would just suggest that caution is needed if there are children and dogs staying; as there is a small area of access to the river at the bottom of the garden. The garden is so large however, that the area can be avoided. It was easy to imagine how lovely it will be during the warmer weather. We made use of the log burner in the living room, with a good supply of logs stored outside, and even although the house is centrally heated, it was an added bonus. Plenty car parking space and the area is lit up at night. The owners have provided superb accommodation, ensuring we all left happy and relaxed. I can highly recommend it for a short or longer vacation. Thank you for your kind comments and delighted you enjoyed the house and garden. No coast or beach but St Andrews / St Cyrus is approximately 1 and half hour drive away. Direct Train from London to Pitlochry. (Kirkmichael 12 miles by road). Fly from all London Airports to Glasgow or Edinburgh. 70 miles Edinburgh to Kirkmichael. Essential that car hire or private car is used. Kirkmichael has a village shop and post office, petrol station. There re also 2 pubs in the village where lunch and evening meals are served. Further afield, Blairgowrie and Pitlochry have banks, restaurants, pubs, shops and supermarkets 12 miles away. In addition, you can visit the distilleries, House of Bruar, Blair Atholl Castle, Glamis Castle or even the Pitlochry Festival Theatre where there is always something on. Booking Notes: 25% deposit payable when booking property which is non refundable. Balance of full payment is 6 weeks before visit. Paypal is acceptable as is Bank Transfer or Cheque. Changeover Day: Check ins are Saturdays after 1600 hours whilst the check out is the following Saturday by 1000 hours. Where the rental period is for 4 to 6 days, the check in day can either be a Saturday or Sunday. Notes on prices: If you need more information, please get back in touch with me.